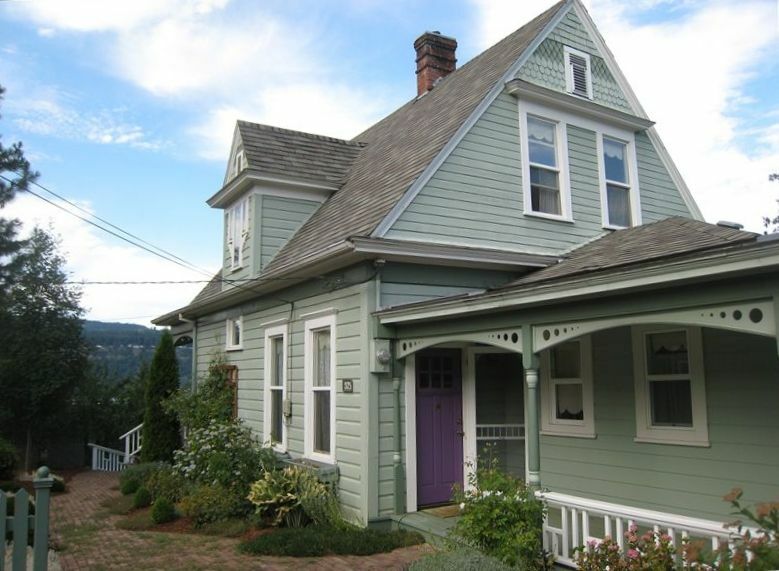 Enjoy this stunning historic two story Victorian house built in 1900 and perched on a bluff top corner lot adjacent to the Hood River with sweeping 270 degree dynamic views. Views include the Columbia River, Hood River, Hood River Bridge, White Salmon Bridge, Washington and East hills, peek-a-boo of Mt Hood, Fourth of July fireworks, and the occasional Mt Hood Railroad tourist train. Portions of the windsurfing “Event Site” and the kite boarding “Spit” are also within view. Enjoy watching the colorful chaos of windsurfers, kite boarders and sailboats while listening to the sound of the Hood River below. Without neighbors on two sides, the unfenced wind-protected private back yard and deck has the same views as the house and is a perfect location to watch human and wildlife activities in the surrounding river gorges below while grilling on the Weber grill under the shade of gnarled oak trees. Sandy uncrowded beaches on the Hood River are only 220 feet away. Walk 2 blocks west to the Indian Creek Trail for running, walking and bike riding along the Hood River. Watch eagles and osprey hunt high above the Hood River and chipmunks and quail scurry about. Walk 8 blocks northwest to Historic Downtown Hood River and all its amenities; see points of interest map below. Minutes from fishing, boating, kite boarding and wind surfing on the Columbia River. 35 miles to Mt Hood Meadows ski resort, 25 miles to family-friendly Cooper Spur Ski Resort, 50 miles to year-round snow at Timberline Lodge and 21 miles to snow parks for tubing. The home is fully set up to act as your base for day excursions and quiet refuge for rejuvenation. The living room has views of both rivers, a gas fireplace, and a 46' LCD HDTV. The house has fast broadband internet access and Wi-Fi. The kitchen with gas range, large windows and 26' LCD HDTV is conveniently located adjacent to indoor and outdoor dining spaces. The expanded cable service in the living room and kitchen offers 75 TV channels and 45 music channels to enjoy while while cooking, dining or entertaining. The Main floor east bedroom has a king bed and view of the Hood River. The upstairs north bedroom has a queen bed, port-a-crib and views of both rivers. The upstairs south master bedroom has a queen bed, half bath (toilet & sink) and views of the Hood River and peek-a-boo of Mt Hood. Both upstairs bedrooms have 27' TVs with basic cable and IPod/MP3 dock clock radios. Extra sleeping capacity is provided by a twin daybed with trundle that can optionally be combined to make a king bed in the living room, the L-Shaped couch adds two spots, and three small foam mattresses can be used anywhere. Lockable gear storage is located under the north porch. Two to four off-street parking spaces and free on-street parking is available. Pets and large groups considered for additional fee, please inquire. Click on the '+' button on the map below to zoom in. Shawn, Sophie and their two children relocated to the Hood River valley in August 2005 from Seattle Washington in order to raise their family in a picturesque small town environment with more indoor and outdoor opportunities than you should reasonably expect in a small community. As full-time year-round Hood River valley residents since 2005, we'd love to share with you from an insider's perspective what we know and love about this award-winning community. We wouldn't live anywhere else! You could live here your entire life and still not exhaust the available opportunities. Feel like you are staying in the mountains while being only 8 blocks to town and 220 feet to Hood River beach. Indian Creek Trail. Outstanding views. Wind-protected private back yard and deck. Short walk to all the amenities of the Historic Downtown district. Minutes from fishing, boating, kite boarding and wind surfing on the Columbia River. 35 miles to Mt Hood Meadows ski resort, 25 miles to family-friendly Cooper Spur Ski Resort, 50 miles to year-round snow at Timberline Lodge and 21 miles to snow parks for tubing. This vacation rental has been in service since August 2008. Beaches of the Hood River are 220 feet below the house. Peak-a-boo of Mt Hood from deck, upstairs south bedroom and front wrap-a-round porch. Yes, for all fixed and convertible beds as well as beach towels. 2-4 paved slots available in driveway. Do not use grassy sideyard. Free narrow street parking. Watch for no parking signs. See Google Maps aerial & Google Street View ground images. No garage but your gear can be stored in the large front entry room or under the north porch which is secured by padlock. Large U-Shaped couch with coffee table facing HiDef cable TV with surround sound and gas fireplace. Daybed reading nook with bookshelf. Premium cookware set and cutlery. Also includes gas range/oven, toaster, blender, wine glasses, Pilsner glasses, ice trays and bar tools. A large square table which seats 8 people adjoins the kitchen. Adjacent deck picnic table seats an additional 10 people during suitable weather. iPod/MP3 docking stations on living room system and also the portable clock radios in each of the two upstairs bedrooms. CD player on living room system. A cabinet full of games and toys for all ages. None at the house but two billiards tables with a nice view of the Columbia River can be found at Big Horse Brewery within walking distance. Non-irrigated unfenced level medium-sized backyard lawn and irrigated level partially-fenced planted small-sized frontyard with brick walkway. Includes Adirondack chairs and large picnic table. One step up to main floor but rest of main level is flat. Some narrow doorways may make the use of wheelchairs difficult. This older home was a perfect strong for my family as we were here for a wedding across the river. We loved staying at the Cliff House. The back deck is amazing, with views of the Columbia and Hood River. The location is very convenient to the waterfront. The hike down to the Hood River is very steep, and only suitable for nimble people. We made use of the living room trundle bed. The living room is separated from the other living spaces, so it doubles well as sleeping quarters. If you are looking to stay in the Columbia River Gourge this ia a great place to stay. Up in the hills from town this house offers a great place to call your own. The house is a charming rustic house which while not being modern, has a great feel to it. The deck and porches are great spaces to watch sunrise and sunset. The house had some nice views and was overall quiet except for the loud heavy truck brakes sounds that somehow echoed up to the house. The central air struggled to cool off the two upstairs rooms and it was a bit too warm for our comfort. Downstairs was cooler and adequate. Overall the house worked well and was a solid choice. Enjoyed the time we spent in Hood River. The house was up a hill and had a great view of the mountains and the river. House was very nice and quaint. Beautiful scenery, location was very convenient. kite boarding, dirt biking, four wheeling, waterfalls, art galleries, free City skate park, wine/brewery tasting/tours, train rides, community indoor/outdoor pool, and Jackson Park free Thursday night concerts and Saturday night outdoor movies.